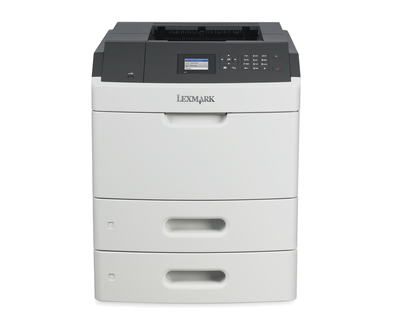 The Lexmark MS812DTN is a high-performance printer with excellent network-ready and reliable workgroup features, ideal for use in busy office settings. It offers built-in double sided printing and impressive print rates of up to 70 pages per minute. The Lexmark MS812DTN monochrome laser printer is best for demanding office settings, offering a maximum monthly duty capacity of up to 50,000 prints. However, the MS812DTN only uses monochrome laser printing technology, which means it doesn't offer colour support, nor does it have multifunction capabilities like fax, copy, and scan. At 20.7x16.7x20.1 inches, the Lexmark MS812DTN black and white printer is compact enough for desktop operation. It features a fast dual core processor and a 512 MB internal memory. The unit even offers versatile paper handling features, ideal for different applications. The Lexmark MS812DTN mono laser printer has a 2.4 inch colour LCD display for easy menu selection, plus it offers excellent connectivity, offering direct USB and Ethernet configuration options. Duplex printing is built in and the memory can be expanded to a maximum of 2560 MB. The Lexmark MS812DTN prints at a maximum resolution of 1200x1200 dpi, and it can spit out pages at a rate of 70 ppm. The device offers excellent duty cycle, and it can process different kinds of print media, from envelopes to card stock, labels, and even transparencies. The network-ready Lexmark MS-812DTN workgroup laser printer also works with almost all kinds of operating systems from Mac, Windows, Novell, Linux, Unix, and Citrix. Additional ports are also at hand, including an internal card slot, high-speed USB, and front USB port. Extra high yield Lexmark MS812DTN toners reduce the frequency of changing cartridges. However, the Lexmark MS812DTN can only print black and white documents and it does not offer multifunction features.